It is our Giantex racing car style office chair that provides additional comfort for you after long hour working. The high ergonomic backrests with lumbar support makes your waistcomfortable. Solid base and flexible wheels enable you can not only feel safe while sitting on it but also move freely and swivel 360 degree. The seat can also be adjusted to match your desk height. Different attractive colors are foryour choice. It will be an ideal chair for your home or office! 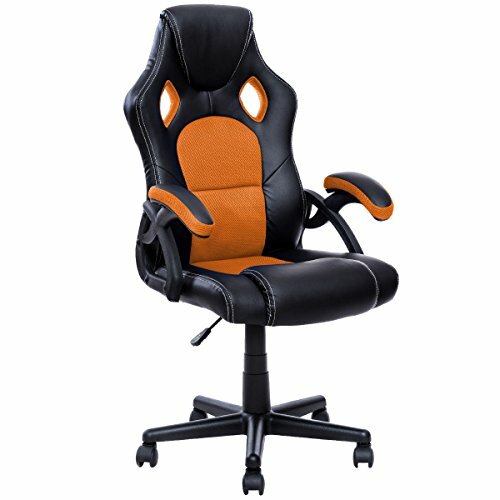 Height From Ground To Seat：15"-19"
Contemporary Racing Car Style- This racing executive chair gives you a cozy and luxurious experience while you sit on it to work or and relax yourself. Different colors matching with black looks vogue and sportive and is a great complement of your home or office. Large Capacity and Flexible but Solid Casters - Five casters are tightly assembled on the solid base with high-quality hardware. They largely enable you can flexibly and freely move in your office or home. Because of their smooth surface, casters can also protect the floor from being scratched. Although it is flexible, it is solid enough to support you with max loading capacity 264 lbs. Adjustable Gas Lift- With pneumatic gas lift, the chair seat height from the floor can be adjusted freely within scale to meet your needs for matching up height of desk. The height can be adjusted between 15''-19''. Ergonomic Chair Design- This chair backrest is segmented to several parts for head and back which meets ergonomic standard. The central part is made of nylon that is breathable and soft as well as good for your waist and back. The top padded part is for your head rest which feels soft and comfortable. Padded armrests can strongly support your arms or hands. Segmented and contoured seat also makes you cozy and relaxed. Easy Assembling and Cleaning Work- Featuring high-quality and durable PU and nylon, you can easily clean it with damp cloth. With detailed and specific assembly instruction for your reference, it is easy for you to assemble it well in short time.